since 2006 has clearly decreased" when compared to leaving smolts in river. The benefit of transportation for smolt-to-adult survival for salmon and steelhead in the Lower Snake River is narrowing and in some seasons and among some adult returns SARs for in-river fish are nearly equal. Another year was added to SAR studies for the Columbia River system, bolstering the number of years in a row showing that smolts left in river are returning as adults in similar proportions as smolts put on barges and released below Bonneville Dam, said Steve Smith of NOAA's Northwest Fisheries Science Center in Seattle. "Transportation is not worse," Smith said last week at the Technical Management Team's Annual Review of Lessons Learned. "In-river conditions are better. With spill and other management improvements, the benefits of transportation since 2006 has clearly decreased" when compared to leaving smolts in river. Smith's presentation, "Smolt Survival and Travel Time and Seasonal Transportation Evaluation for Salmonids in the Snake and Columbia Rivers Update with 2013 Data," was first presented to the Bonneville Power Administration Dec. 6, 2013, and can be found at the TMT website here. 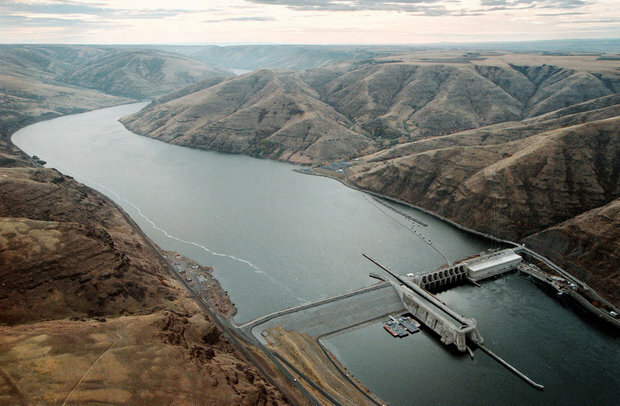 Overall in 2013, 33.6 percent of yearling chinook from the Lower Snake River hydro system were barged. In 2004 and 2005 that number was 90 percent to 95 percent. Some 37.8 percent of steelhead smolts from the Lower Snake were transported in 2013, much lower than 2004-05 when almost 100 percent were barged. One reason for better adult survival is better smolt survival as they travel downriver to the ocean as surface passage and spill continue to promote shorter travel times. Surface passage routes have been installed on all eight mainstem dams (the last was in 2010) and dams are spilling at the same or slightly higher levels. Although the difference in survival is narrowing between transportation and in-river smolts, the decision to stop barging all together is not imminent. TMT makes year to year decisions on transportation that depend on weather and river conditions and the trend is toward less transportation, said Bruce Suzumoto, senior policy adviser for Interior Columbia Basin for NOAA Fisheries. But not all fish benefit from staying in-river. For example, chinook salmon don't benefit as much from barging as do steelhead. In addition, some information is lacking on barged fish as they have a tendency to stray on their return to the river. They may be surviving but they are not heading back to the area of their origins, so they aren't being counted. That gap in information needs to be closed or understood. "I don't think anyone wants to continue transport if it's not necessary," Suzumoto said. "It would be a regional decision to stop. NOAA would work with the action agencies. As we do that, we would likely need to improve all other hydro operations, such as spill and flow. I don't think we're there yet. The jury is still out on whether it is good enough." The federal biological opinion for salmon and steelhead calls for survival and recovery and there are a lot of ways to get there. One tool the BiOp lists is transport, Suzumoto said. A decision to not use transport would require a change to the BiOp and the US Army Corp of Engineer's fish operations would have to be modified.